Tottenham believe they have a chance of making history and it has certainly been difficult to keep a lid on the excitement that is building for their Champions League quarter-final, second leg at Manchester City on Wednesday. They lead 1-0 from the first leg. As such, the visit of relegated Huddersfield felt like a distraction; an irritation, even. It added up to a test of Spurs' mentality, which Mauricio Pochettino has had cause to criticise on a few occasions this season. The points were still imperative to the club's top-four aspirations. Pochettino could rest easy. The victory was not in doubt from the moment Victor Wanyama sashayed through to score the first goal, and it was glossed by a clinical hat-trick from Lucas Moura - the Brazilian's first since his move to Europe and Paris Saint-Germain in January 2013. He celebrated at full-time by having a kickaround with his little son on the pitch. How the crowd loved that. Pochettino's decision to rest the majority of his big guns for the City tie was vindicated. 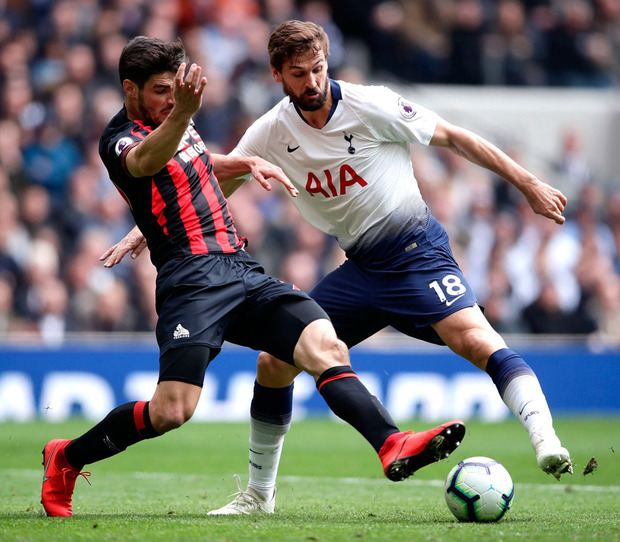 The manager had indicated on Friday that Son Heung-min was in condition to play but, in the event, he found a way to use him as a late substitute. That way was to revert to a back three and include Jan Vertonghen. Christian Eriksen and Moussa Sissoko were the only other first-choice outfield players to start. Sissoko was excellent, departing to a standing ovation when he was substituted. Pochettino was without the injured Harry Kane, and he did not risk Dele Alli, who broke his hand in the first leg against City and is coming to terms with playing in a protective cast. Pochettino said he was unsure whether Alli would be OK for Wednesday. "He needs to feel comfortable and it's painful," he said. Also a doubt for the second leg is Harry Winks, who felt his groin in training on Friday. The team news was always going to be a prominent sub-plot and it was not just that of Spurs that registered with a degree of force. Huddersfield's stay in the Premier League has proved short-lived and for manager Jan Siewert, it is time to test out players for the Championship - and overlook those that could fetch a transfer fee in the summer. Hence, Jonas Lössl, Philip Billing and Mathias Zanka are fading from view. Siewert also demoted Aaron Mooy and Alex Pritchard to the bench. Huddersfield roused themselves in the final 20 minutes. Sissoko had to tear back to put off Karlan Grant; substitute Steve Mounie missed a gilt-edged header and Hugo Lloris tipped a Juninho Bacuna free-kick against the crossbar and away. But the gulf in class was plain and for much of the game it was difficult to overstate how bad Huddersfield were. Siewert has lost 10 of his 11 matches in charge. Spurs, by contrast, have won three out of three at their new stadium and kept three clean sheets. Their strength in depth is sometimes questioned but Pochettino could call up players of proven quality, not least Moura, who was in the mood from the outset. He put Spurs in charge with the second goal on 27 minutes; it was a rasping finish, after Sissoko had played him in. Moura would put Huddersfield to the sword at the end. First, he took Eriksen's cross and guided a shot past Ben Hamer and then he collected Son's pass and fired into the far top corner. 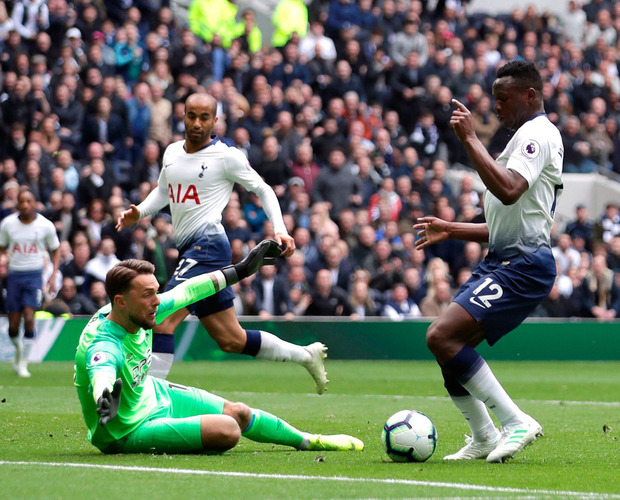 Wanyama's goal was his first for Spurs since a piledriver at Liverpool in February 2018, and it involved a well-timed burst and an ice-cool walk around Hamer. Fernando Llorente laid it on and his link-up play was a feature of the match. Llorente did everything but score. His best moment came early in the second half when he took a lovely touch from Juan Foyth's pass and, first time and on the volley, lifted the ball against the crossbar. 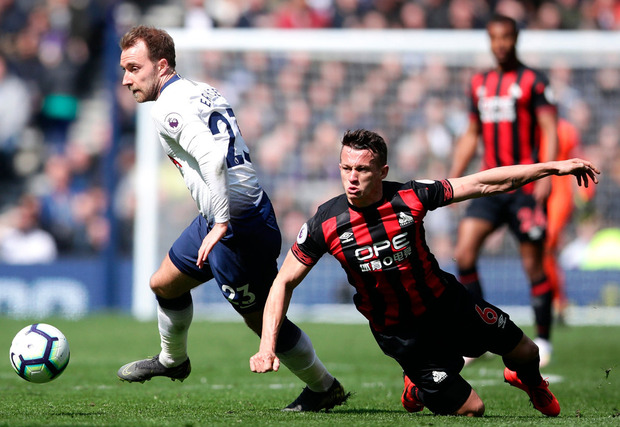 Huddersfield's only first-half flicker came when Jon Gorenc Stankovic fluffed a volley from Bacuna's corner, while Eriksen would hit the post with a deflected shot in the 81st minute. Now for City.